This entry was posted in International Law, Treaties, War Crimes by Hawaiian Kingdom. Bookmark the permalink. It’s good to see that some action has been taken for the wrong doings of the U.S., a nation “under the rule of law”. We await with wonder, will there be a “lawful” response? Mahalo nui loa Dr Keanu for all you do. As a member of Hui Aloha Aina and Ka Lahui Hawaii #62888 I want you to know that your tireless and selfless efforts are not lost on me. My advocacy of your amazing work will always be. Imua mau LLHK. How interesting that Trump met with Korea, China, UK, and the Russia post receipt of the ROM. My gut tells me that Trump’s efforts to ho`omalimali these powerful countries in hopes that they will come to the defense of America’s 125+ years invasion of the Hawaiian Kingdom. Dr. Sai’s letter to the United Nations Secretary General …States shall not ‘recognize as lawful a situation created by a serious breach within the meaning of Article 40, nor render aid or assistance in maintaining that situation… It’s clear to me what can happen if other countries conspire to vindicate the America’s crime. Mahalo nui loa to Chairman, H.E. David Keanu Sai, Ph.D. of the acting Council of Regency for the Hawaiian Kingdom. 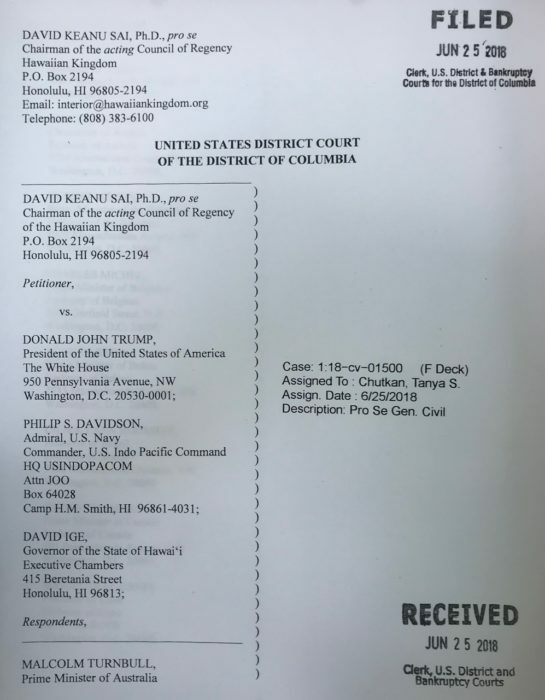 Time to rise up Kanaka Maoli for Our Hawaiian Kingdom Mahalo David Keanu Sai, Ph.D.
Mahalo, Keanu, for your strategic work on behalf of the Kingdom. And good on ya for producing those foreign-language versions of the docs! Maybe, with a certain president alienating the world, countries will not be so willing to kow-tow to Uncle Sam, despite political, military and economic pressures. A hard ask, but you nevah know! Mahalo Dr. Sai and all the stone eaters. You are patient, and learned and persistent and may yet resecure your nation. Even though far away, there are many who support your mana with theirs and wish you well. My kupuna would be proud of all that you are accomplishing. Mahalo Dr. Keanu Sai and the team that supports this endeavor to bring forth pono. We stand together as Hawaiians be strong, Dr. Keani got the ball rolling in the right direction, let’s not be like crabs in bucket, let Dr. Keani and his people do their thing in pulling this through We shall always stand behind him for support. I’m just curious if there is a way to find out whether the UN circulated this letter, as requested.